A vehicle-mounted power wheelchair lift should take up only a small amount of space, be quick and easy to use, and be convenient. The Harmar AL580XL Power Wheelchair Lift is all of those things. With its tidy, space-efficient profile and one-switch operation, it takes up very little space and is easy enough for anyone to use. You won't have to modify your mid-wheel drive power chair with 14" wheels to make it fit, either. A hold-down bar that slides over the seat will hold your power chair securely in place. 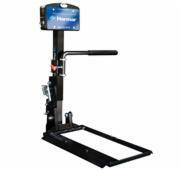 If you prefer, you can even purchase the Harmar AL580XL lift in a swing-away model for more convenience.